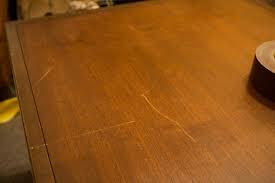 Did you know that you can use a felt tip marker to hide deep scratches in your wood furniture? It’s very easy to do and the only trick to it is to match the color as closely as possible. I suggest visiting an art supply store instead of your local hardware store to find the exact match. Remember, the color may darken a bit after soaking into the wood so you might try just a shade lighter to start. You can always darken it if you need to. The best method to use is to dab the marker into the scratch, let it dry for about 5 minutes and then even it out by applying a light stroke with the tip. This is the best remedy for dealing with a few deep scratches. If, however, you have quite a few gouges that go deeper than just the surface you may need to actually refinish the entire piece and that’s a lot more work than we can cover here! For all of those light surface scratches that you’re tired of looking at there’s a simple fix as well. Just so you know this won’t harm your furniture in any way if it is less than 50 years old. However, if it is an antique of 50 years or more you will need to perform a simple test before you begin. First of all you could actually lower the value of an antique if you alter it in any way and secondly the shellac finish on old furniture will not react well to the Danish oil that we will be using in the next step. To find out simply place a few drops of alcohol on the finish in an unobtrusive spot, if it dissolves then you know you’re dealing with a shellac finish. All you will need to completely remove all of the minor scratches and dings from your wood furniture will be some clear or neutral Danish oil (available at the hardware/home improvement store) and extremely fine steel wool (0000). Yes! Steel wool is perfectly OK to use provided that it is the proper gauge as mentioned. Pour a generous amount of the Danish oil onto the steel wool and begin rubbing the wood surface. Always rub with the grain, not against it and pay close attention. The fine surface scratches that you see are actually in the clear finish that protects the wood surface and not in the wood itself so you only need to remove enough of the finish to eliminate the scratches. You don’t want to remove any of the finish that is under the surface, just the scratches themselves. Adequate lighting will make this a lot easier to do. Don’t worry, you will be able to see when you have removed the scratches very easily, it’s just a matter of paying attention. As you eliminate the scratches be sure to also rub the small area surrounding it in ever decreasing amounts. Does that make sense? In other words, after buffing out the scratched area continue to rub the space just around the area but more lightly and with less pressure. This will leave a nice smooth transition from where the scratch was to the unscratched surface areas. Remember, this is to remove surface scratches only, not deep scratches that go down into the wood itself. I have done this myself and it works wonders for wood furniture. You might be surprised just how many scratches you will find if you take a close look at your furniture and this simple method will remove them all! A WORD of CAUTION: Be sure that the area you will be working in is well ventilated and without open flames. Danish oil is slightly toxic and flammable. Take the same precautions as you would if you were paining a room and you will be fine. Also be aware that Danish oil can spontaneously combust if left in crumpled up rags or steel wool. You can easily avoid this by simply spreading them out and allowing them to dry outdoors. After that it’s perfectly safe to throw them in the trash.